The Shabbos table: It's that special place where we reconnect with family, friends, and guests to taste and experience the sanctity and purpose of creation. It's also the perfect setting in which to transmit the beauty of Shabbos to our children. 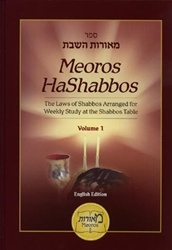 Meoros HaShabbos is an innovative new text, especially designed to make the laws of Shabbos a lively, enjoyable, and informative part of your family time at the Shabbos table. The book is conveniently divided into "weekly portions" and each portion has two parts: one for the night meal and one for the day meal. These bite-sized portions of halacha, spiced with delightful stories of Shabbos, will become a most welcome "edition" to your Shabbos table. 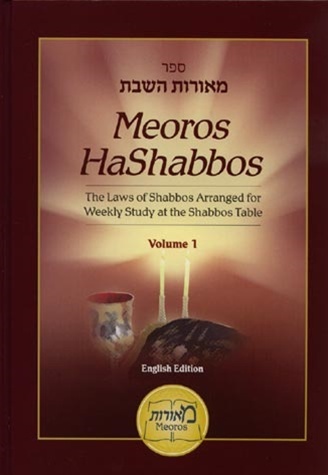 Further enhance your family's time together as you learn or review the laws of Shabbos in this entertaining and informative way. Meoros HaShabbos: the perfect condiment at your Shabbos table.